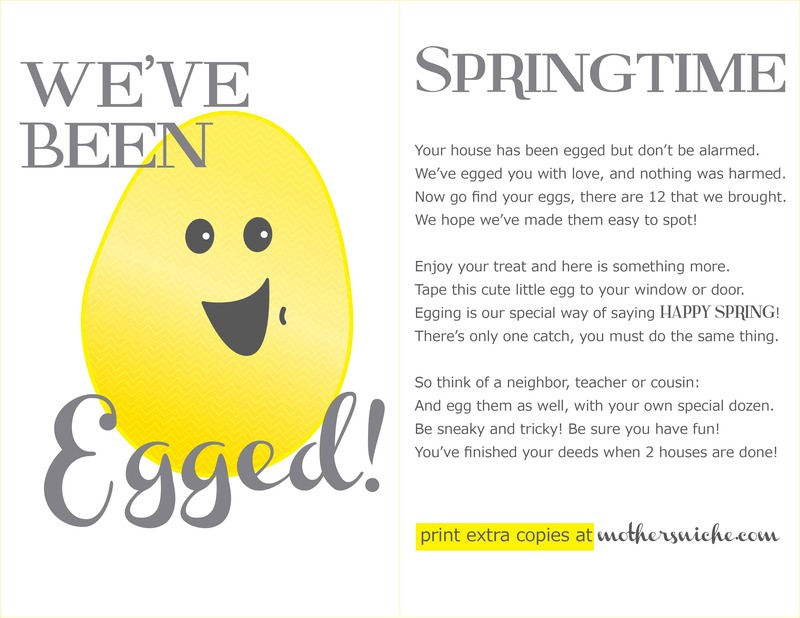 Easter Printout: "We've Been Egged!" March 6, 2013 By Tina M 11 Comments This post may contain affiliate links. Read my disclosure policy here. Who doesn’t love a fun Easter Printout? 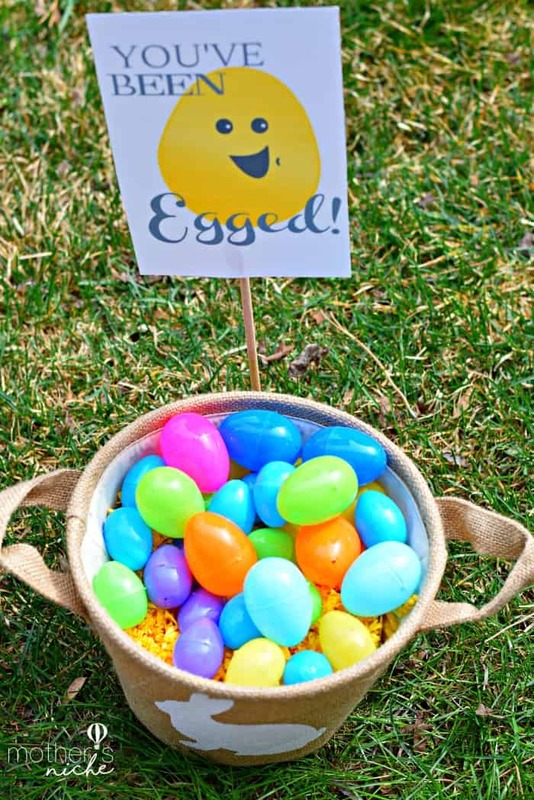 Here’s a fun Idea for Kid’s Easter enjoyment! If you know me, I like anything sneaky and fun. Here’s our new Easter tradition! Kind of like “You’ve Been Boo’d” only Easter Style! If you’ve ever wanted to egg someone’s house, now is your chance. Release the rebel inside! But remember, this is the nice version! 🙂 Ditch this off at a neighbor’s house with a dozen plastic eggs, run and hide! Your house has been egged, but don’t be alarmed..
We’ve egged you with love, and nothing was harmed. We hope that we’ve made them easy to spot! Tape this cute little egg to your window or door. There’s only one catch….You must do the same thing! And egg them as well, with your own special dozen! You’ve finished your deed when 2 houses have been done! Remember that Easter is in March this year, so it’s not too early to start egging your neighbors! Besides, after the winter we have had this year, I think we are all in for some springtime fun! You don’t have to do plastic Easter eggs either, just do what’s fun for you! *Update: I ran across this adorable blog that had the idea of putting money in the eggs and “egging” neighbors or friends that are going through financial hardship! Love that idea! My family has boo’d and has jingled our neighbors, and just this morning, my middle son was thrilled when he came up with the idea to egg them too! Your printables just saved me a lot of time. I also like that you decided to hide the eggs instead of giving them in a basket. Cute! Thanks! BTW, if you want to see my posts about booing and jingling, I hope you’ll stop by my blog. 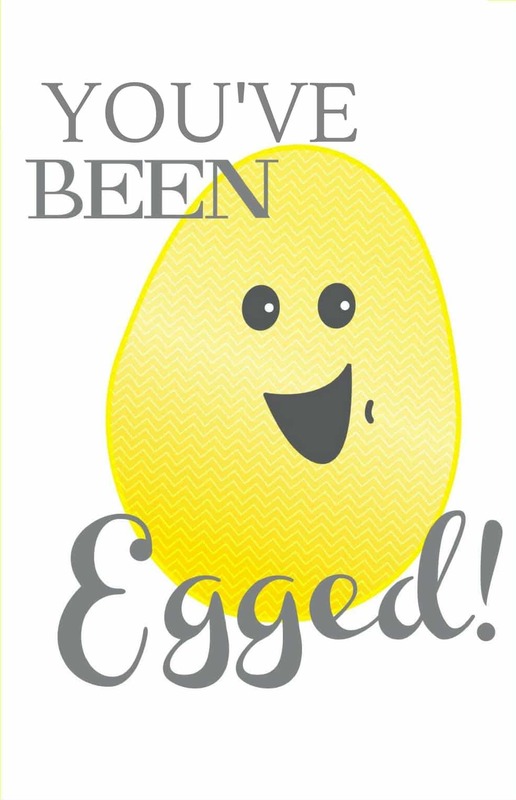 Okay, I promise I’m not blog stalkin’ you, but I’d like to link up to this post from my blog because I posted today about making Christian Easter eggs and think your egging idea would be a fun way to share them with others. Here’s my post: http://thedomesticatedprincess.blogspot.com/2013/03/christian-easter-eggs.html. Oh I love this! What an awesome idea! My children would have LOVED this when they were little, both in doing it and having it done to them. Thank you so much for linking up to “Making Your Home Sing Monday” today! What a cute idea! We so this at Halloween with a phantom ghost visiting neighbors, and I love another reason to do it. Thanks so much for the great idea! Have a wonderful day! I LOVE this. Absolutely love it. Hooray for celebrating the holidays and making them FUN!